A close look at disease and suffering would lead most of us to the same conclusion: our natural environment is inextricably linked to our health. When the Army Corps of Engineers approved the construction of the Dakota Access Pipeline (DAPL) in July 2016, thousands of water protectors from across the world gathered in protest. Through staunch, organized resistance, indigenous activists and their non-indigenous allies refuted the proposed pipeline, which now shuttles over 500,000 barrels of oil per day through the Standing Rock Sioux’s sole water supply and most coveted burial grounds. 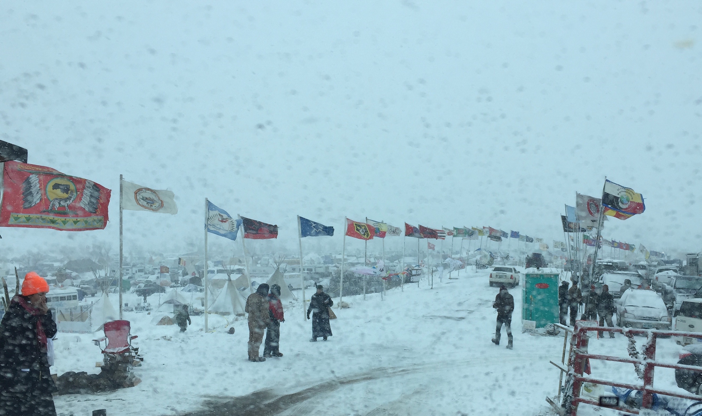 In December 2016, I joined the thousands at Standing Rock to briefly bear witness to their commitment to protecting the health and well-being of future generations. Eager to assist, I provided medical care to these heroes, many of whom had given up their jobs, quit school, or come out of retirement in solidarity with the water protectors. Their determination and strength became even more inspirational when a blizzard brought -40° F in its wake, trapping everyone inside the camp for several days. After battling corporate juggernauts, state governments, and fossil fuel lobbyists for months, the Standing Rock Sioux Tribe and their allies neared victory when the Obama administration denied a permit required for the pipeline’s completion. 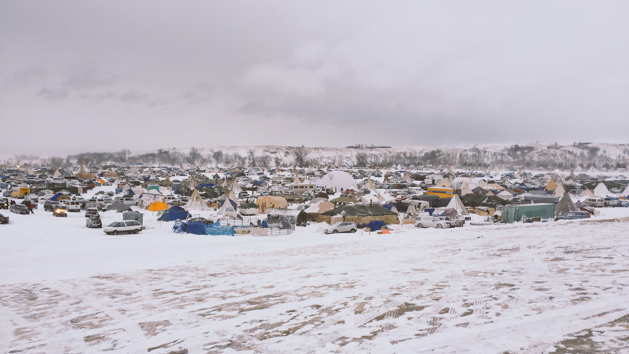 Just a couple of months later, however, President Trump authorized its advancement and on February 23rd, 2017, the U.S. National Guard evicted the final Standing Rock protestors from the Oceti Sakowin camp. Last week marks the two-year anniversary of that eviction. 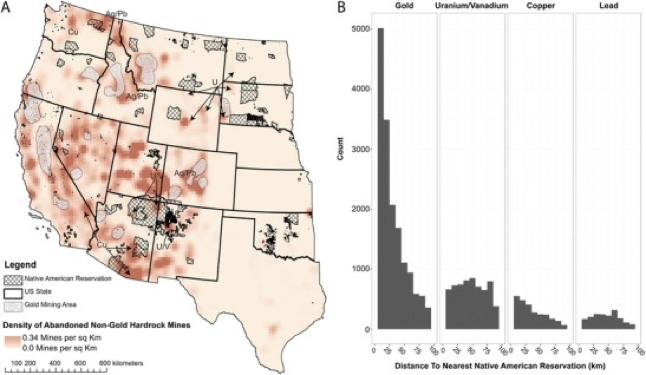 As a result, adults, neonates, and children from communities near these abandoned sites live with higher levels of uranium and other toxic metals, increasing their risk of “developing multiple chronic diseases linked to their proximity to the mine,” such as “kidney disease and hypertension.” Surely not by coincidence, between the 1970s and the 1990s, cancer rates doubled on the Navajo Nation. Unfortunately, as this week’s anniversary reminds us, this era of profit-driven exploitation has not yet passed. As physicians, we must educate ourselves on how profit-driven policies lead to specific diseases in the Native American patients we have the privilege to treat. To be sure, involuntary exposure to uranium is a root cause of suffering and disease in these communities. We have a responsibility to our patients to avail ourselves of this history that is taught in few- if any- medical school textbooks. Above all else, this anniversary is a reminder of the power in mass mobilization to catalyze a movement that spurs headlines and support from all over the world. The water protectors at Standing Rock were a fraction away from halting the construction of DAPL, and they have not given up yet; two years later, thousands of water protectors struggle together, mostly unseen from the public’s eyes or the media’s attention. With the health consequences of these policies historically evident, it is time that more physicians join the struggle to protect the health of future generations. Internist, Pediatrician, and Associate Professor at UCSF, Dr. Le is also the co-founder of two health equity organizations, the HEAL Initiative and Arc Health. This article originally appeared on Arc Health here. Pretty political. Shouldn’t we be talking about total risks to everyone? …sending oil by train, trucks vs pipeline? …vs not sending oil and resulting prices of heating homes and businesses? And health risks therefrom? Also, U238 with <1% 235, hmmm? Not very radioactive. We need to go way back and study this from scratch. You may be right; you may be wrong. Sending oil by any means is death to this planet and the life it supports. This is the oil age and as with all ages it will come to an end by exhaustion of the resource. In the mean time population explosion and global warming from fossil fuels will mean the health risk of extinction. Are you proud to leave your kids and grand kids with this legacy? So does that mean you’re a global warming denier? Science—me too—is only interested in sharpening our predictions of what is going to happen in nature. It has nothing to do with beliefs. There were some papers in Nature magazine recently trying to show that H2O was forcing, as it should be, but a statistician found big problems with the papers. The climate was not predicted well from 1998-2019. The lower troposphere temps were almost unchanged. absorbs half of what the first half has absorbed. I.e it has a logarithmic effect. So each layer of new carbon dioxide absorbs 1…1/2…1/4…1/8th the amount has the first layer. Look at water vapor and water droplets and look up latent heats, etc. Then you can figure out all this stuff by yourself. Then I don’t have to believe my doctor – I can go out and study WebMed to better make my own diagnosis. I think that’s right, Peter. You can focus in on what you think is your diagnosis, and, if is a rare disease, you may arrive at the diagnosis sooner than your doctor. But go to ncbi.nlm.nih.gov….so you can read the literature. Docs get experience, osmosis, and wisdom just from long careers and this can’t be beat if your illness is common.